At Twisted Barrel Winery we are committed to producing only the highest quality, small lots, of wines possible. We have an affinity for the reds and especially the Italian and Spanish varietals. We will continue to innovate and bring new and exciting wines to Lodi. As in days of old, at Twisted Barrel we take a "hands on" approach to wine making. We use only the finest oak barrels to "Twist" the best qualities out of our wines! 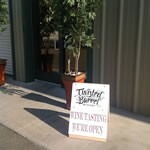 We invite you to visit and see how we do things...Twisted Barrel style!